Can You Lose Weight With Healthy Choice Meals? Recognizing that you need to lose weight for your short- and long-term health is a significant accomplishment. Determining how you will go about losing weight, however, can be a challenging task. To lose weight, you need to consume fewer calories than your body burns each day. Including Healthy Choice meals in your weight-loss program can help you with portion control and simplify the task of keeping track of your daily caloric intake. The American Dietetic Association recommends a weight-loss plan that limits your daily calorie intake to 500 to 1,000 calories less than you need to maintain your current weight. With this level of reduction in daily calories, you can expect an average rate of weight loss of 1 to 2 lb. per week. 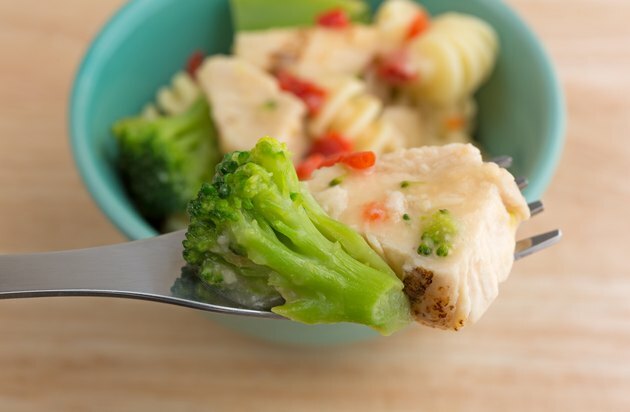 Healthy Choice Complete Meals contain 250 to 420 calories, depending on the entree you choose. Healthy Choice Select Entrees contain 170 to 380 calories, and Café Steamers have 230 to 340 calories. Depending on your target number of daily calories, incorporating low-calorie Healthy Choice meals into your nutrition plan may help you reach your weight-loss goal. The manufacturer of the Healthy Choice product line promotes its meals as being high in protein and fiber. If your diet has historically been skewed toward carbohydrates, adding protein and fiber while scaling back on your calorie and carbohydrate intake can help you lose weight. The amount of protein in Healthy Choice meals varies widely, ranging from 6 to 22 g. In general, the meat and poultry entrees have higher concentrations of protein than the vegetable and fish selections. Healthy Choice Complete Meals provide you with 5 to 9 g of fiber. The Select Entrees and Café Steamers contain less fiber, on average, with 3 to 7 g per meal. A healthful weight-loss plan includes the recommended daily servings from each of the food groups while limiting your total intake of calories. The servings from the different food groups vary in Healthy Choice meals, depending on your selections. Healthy Choice Complete Meals provide you with a moderate amount of meat, poultry or seafood, ranging from approximately 1.5 to 2.0 ounces. Many Healthy Choice meals also contain grains, included primarily as rice or pasta. All Healthy Choice meal options contain vegetables; the amount ranges from 1/2 to 1 1/4 cups per meal. Fruit and milk are notably absent from most Healthy Choice meals. If you choose to incorporate Healthy Choice meals into your weight-loss plan, be sure to include other sources of fruit and dairy foods in your diet. The manufacturer of Healthy Choice meals provides Weight Watchers points and diet exchange information to help you integrate their products into various weight-loss programs offered by Weight Watchers International, the American Dietetic Association and the American Diabetes Association. Depending on the extent to which you incorporate Healthy Choice meals into your weight-loss program, the cost of meals may be a consideration. If you have ongoing health concerns, talk with your doctor before embarking on a weight-loss program.